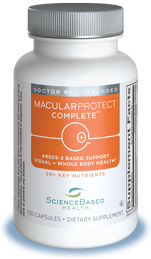 MacularProtect Complete AREDS2 is a convenient, all-in-one formula providing powerful support for macular & whole body health. It offers nutrients at levels found to promote healthy vision in the AREDS and AREDS 2 clinical trials, including 10 mg of lutein & over 30 other key ingredients. Applies to any product combination. Try the MacularProtect Complete AREDS2 Drink Mix! Convenient, all-in-one formulation provides powerful support for macular and whole body health. No additional multinutrient is needed. Appropriate for individuals concerned about maintaining visual and overall body health. Contains vitamins C and E, zinc, copper, lutein and zeaxanthin at levels found to support eye health in the AREDS and AREDS 2 clinical trials. New! Now with olive leaf extract and more trans-resveratrol! Provides 10 mg of bioavailable FloraGLO® lutein and 2 mg of FloraGLO and OptiSharp zeaxanthin. Features comprehensive multinutrient support with over 30 additional key nutrients, including a diverse array of bioflavonoids, antioxidants and other essential vitamins and minerals to protect the health of the whole body. Made from premium ingredients and manufactured according to the highest quality standards. Recommended dose: four capsules per day (two capsules taken orally, twice daily with meals). Read about the scientific rationale behind this product in the MacularProtect Complete AREDS2 monograph. View the MacularProtect Complete AREDS2 brochure. Suggested Use: take a total of four capsules daily, with meals (two capsules taken orally, twice daily). Note: pregnant or lactating women or individuals with medical conditions should consult a physician before using. Note: MacularProtect Complete AREDS2 contains 80 mg of zinc, a level that was found to support eye health in the AREDS clinical trial. It is important to check with your physician prior to taking this product to ensure that this level of zinc is appropriate for you. Following are some frequently asked questions about this product. Click on a question to view each answer. I see that "MacularProtect Complete-S" has been renamed "MacularProtect Complete AREDS2": is the formula the same? Yes. MacularProtect Complete AREDS2 uses exactly the same formula as MacularProtect Complete-S. Does this product meet the new AREDS2 recommendations? MacularProtect Complete AREDS2 includes the nutrients and levels recommended by the National Eye Institute, based on the findings from the AREDS2 clinical trial. In particular, this product is beta-carotene free, and also includes 10 mg of lutein and 2 mg of zeaxanthin. Providing over 30 key nutrients, MacularProtect Complete AREDS2 also includes a complete multinutrient component, plus a wide array of cell-protecting nutrients. What were the findings of the AREDS and AREDS2 clinical trials? The findings for the Age-Related Disease Study (AREDS) were released in October, 2001. The AREDS clinical trial has been heralded by doctors and nutrition experts as the most significant clinical trial on nutrition and age-related macular degeneration (AMD) ever. Findings of the 6 ½ year AREDS clinical trial, demonstrated a statistically significant reduction in the rate of progression of AMD in 3,640 patients taking a supplement containing vitamins, antioxidants and zinc. The AREDS2 clinical trial, released in May, 2013, tested several variations of the original AREDS supplement, in addition to omega-3 fatty acids from fish oil, and lutein and zeaxanthin. Read more about the findings here. Based on the findings from AREDS2, the National Eye Institute now recommends a beta-carotene free formula (with lutein and zeaxanthin), such as MacularProtect Complete AREDS2. I've heard that people with certain genetic profiles should use a zinc-free macular supplement - is that really true? A recent analysis of genetic data from the AREDS clinical trial questions the role of zinc for those with certain genetic risk factors for age-related macular degeneration. However, these findings are not supported by an earlier analysis of AREDS data, which found health benefits from zinc across all genetic profiles examined. SBH has consulted with top experts in the fields of genetics and nutrition - including Elizabeth Johnson, PhD of the USDA Human Nutrition Research Center on Aging, and Professor, Friedman School of Nutrition and Science Policy at Tufts University. Since there have been only two studies of limited size on this topic, and since the most recent findings have not been corroborated, more research is clearly needed. The National Eye Institute continues to recommend a macular formula that includes 80 mg of zinc for those with intermediate to advanced AMD. SBH will continue to monitor the research on this topic. To view SBH's detailed response to this issue, click here. What's the difference between MacularProtect Complete AREDS2 and MacularProtect AREDS2? In addition to the nutrients studied in the AREDS and AREDS2 clinical trials, MacularProtect Complete AREDS2 contains a complete multivitamin / multinutrient for overall body health. No additional multinutrient is needed. MacularProtect AREDS2 is a stand-alone product based on AREDS and AREDS2 - but does not provide a multinutrient component. Should I take a multivitamin in addition to MacularProtect Complete AREDS2? An additional multivitamin should not be used with MacularProtect Complete AREDS2. MacularProtect Complete AREDS2 is a powerful formulation to protect macular health and also includes a complete multivitamin. The multivitamin component of MacularProtect Complete AREDS2 is robust, providing meaningful quantities of key nutrients at higher levels than are found in most daily multivitamins such as One-A-Day® or Centrum® Silver. I have a family history of macular health issues, but no immediate eye health concerns - should I use this product? In this case, it would generally be recommended to take a multivitamin instead, such as OcularProtect, which provides robust support for eye and whole body health. MacularProtect-Complete AREDS2 is a convenient, all-in-one nutritional formulation that includes the nutrients at levels studied in the AREDS and AREDS2 clinical trials plus a complete multinutrient for whole body health. It is free of beta-carotene for those who should avoid high levels, such as smokers.